We offer translations in any combination involving Japanese, Dutch, and English. In terms of content, you can rely on us for the most varied assignments. We have experience in translating everything from manuals, articles of incorporation, minutes, compliance guidelines, patents, financial statements, and position papers to press releases, newspaper articles, scientific publications, websites, videogames, subtitles for movies, documentaries, and entertainment programs, personal letters, and even pure literature. We strive for nothing less than perfection in all our translations, never satisfied with work that is merely “correct.” What we aim for are translations that any native speaker would consider 100% natural. To make good on that goal, every single one of our translations is carried out or meticulously revised by a native speaker of the target language. That’s why our clients often tell us that the quality of the translation actually surpassed that of the original. Waran Translations is your solution for sworn and legalized translations of any official document. We follow a standard procedure to ensure optimal quality. First, you send us a scan of the document with an apostille (as necessary) as an email attachment, which we then translate with the utmost care and precision. 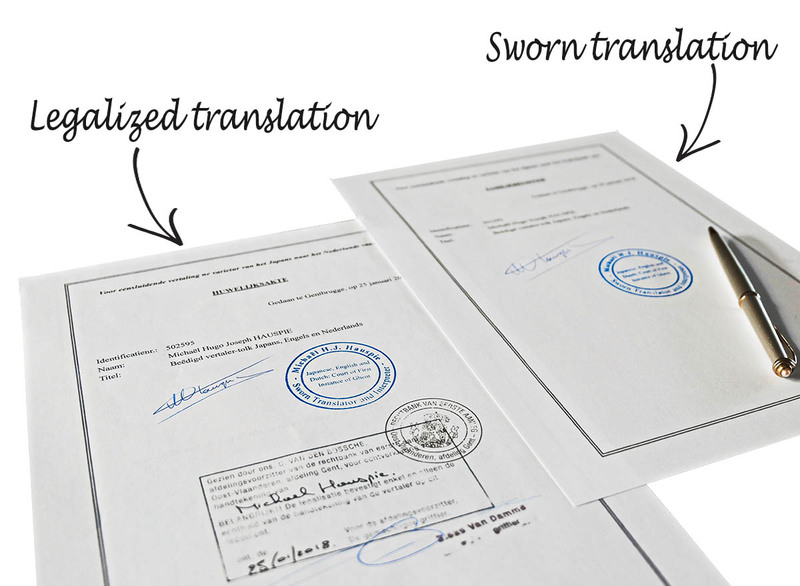 For a sworn or certified translation, we attach a statement, signed by the translator, attesting to the truthfulness of the translation. For legalized translations, meanwhile, certification from a court of law accompanies the translator’s signature. The Belgian administration usually requires legalized translations. Names in official Japanese documents are often in Japanese characters or katakana script only, which creates the possibility for multiple readings or makes it hard to trace the alphabetic spellings of foreign names. In such cases, we always contact the client to verify names before swearing the translation or submitting it to the court. When the translation is all ready, we send it to the client by registered mail. Don’t worry if you still have questions about certain procedures. With our advice, we will help you navigate the most challenging administrative labyrinths.